Another week nearly done. Not as much painting time as I would like, but I think that will be remedied next week. I did start work on a few new canvases (along with continuing work on others). Earlier in the week I had my second WARM interview. Phenomenal experience. The interview process alone has influenced my studio work. Talking about my work with the potential mentors has helped me think about the direction I want to go with with my work. It has also influenced how I'm doing some of my work...encouraging me to experiment and play a bit more. And so I did just that...this week I pulled out some watercolor paper and paints. My goal was to do some quick studies...to loosen up, explore colors, subject matter...When I first started painting (back in high school! ), I did a lot of work with watercolors...not so much anymore, but I still like how it feels working with the paint so wet. For a little bit, I was in my painting zen state...loving how the paint was flowing on the canvas...I felt like I was channeling my inner Georgia O'Keefe. But in a flash, the moment was gone...reality shifted, and the paint just wasn't flowing as easily. Painting is like that...sometimes it goes smoothly...and sometimes, it's hard work...it's a back and forth process really...the good mixed with the bad...a constant questioning of what to do, how things should look...and then sometimes it just happens...the brush leads the way. I'm a long way from a finished painting with this one, but I'll keep dancing with the paint...and let the brush take the lead. I spent a good chunk of today at the studio. When I opened the door I was pleasantly reminded by the sight of a clear table that I had cleaned my work space. I should have taken a picture, because it didn't stay clean for long! I worked on a number of projects, going back and forth from smaller projects to this larger (20x24) painting. She is far from finished, but I like how she's coming along. This picture doesn't really show how vibrant the colors are. And I bet you're wondering about the "hair wings" ... you'll just have to wait to see how that turns out. She's going to be quirky and fun. Allow me to apologize for being a bit scarce around here lately...I've been in sort of a deep cleaning mode, at home and at the studio. I finally cleaned up this little sitting area in a little corner of our bedroom. The chairs have been there for ages, but tend to be the dumping ground for clothes and what not. The whole idea has been to have this space near the windows where hubby and I can sit to talk, read, or just watch the river. I suppose it is a good time for fall cleaning, but I think this little bout of cleaning is just as much about me working through this transition in my life. I'm not done yet, but I'm making headway. I was finally ready to go through some papers and other items I brought home when I left my job five months ago (in some ways, I feel my job left me). It has felt too emotionally charged to do it any sooner. I had to leave things set a bit, so I could separate myself from these things. But it was time. As I sorted through these things, I packed some things away, found new places for other things, and tossed a whole lot out. With every bag I tossed away, my spirit felt a little free-er to move on. So much of life is filled with uncertainty...the unknown. It can scare you, if you let it. Believe me, I have those days. But the only way I have made it through the past five months is by embracing the unknown as possibility and adventure. I won't lie...I feel uncertain and even scared at times. But there is also a part of me that has seen this layoff as a gift, a rare opportunity to explore other options for my life. It's not easy to stay in that place. I sometimes have to keep myself from falling into a perpetual state of panic or despair. But because I am trying to look at this time as a gift, I have been a bit bolder and ready to take a leap of faith...in myself. The cool thing is that my hubby is doing the same. In the past five months, he has reignited his passion for acting. He's been running all over town, going on auditions, taking parts in student films, answering calls for film extras... And it is beginning to pay off...he has a lead role in a community theater production and is getting more and more calls for some paying gigs (it's nice to be compensated sometimes!). Last night as we were recounting some of our recent exploits to my son, he quipped, You are one artsy couple." Ya, we are...and quite happy pursuing our dreams. My leap of faith is all about taking myself more seriously as an artist and being bold enough to declare myself just that, an artist. I am working hard to commit more time to my art, to challenge myself as an artist and grow. And so, I feel ready to take advantage of this gift and use it as an opportunity to participate in a program that I think will make me a stronger artist. A little over a month ago, I wrote about the WARM mentor program. Over the past month, I have attended a couple mentor introduction sessions. I am just starting the process of interviewing with possible mentors. Interview...the very word is anxiety-producing. Yesterday, before my first interview, I was about as nervous as I could get. That negative critical voice inside my head was working overtime, with fears of not being good enough. It was no easy task to quiet that little monster. Thankfully, five minutes into the "interview" I had calmed down considerably and was, for the most part, able to enjoy this incredible opportunity to review my work with a more experienced artist. It was a wonderful experience. Sometimes it is good to see your work through someone else's eyes. I left feeling my work is stronger than I give myself credit for...and I felt more clarity about what direction I want to go with my work. I still have two more "interview" experiences...spread out over the next few weeks. Mentors and protegees will be matched when the interview period is completed--November 15th. In the meantime, I will continue plugging away...and trying to make the best use of this opportunity. 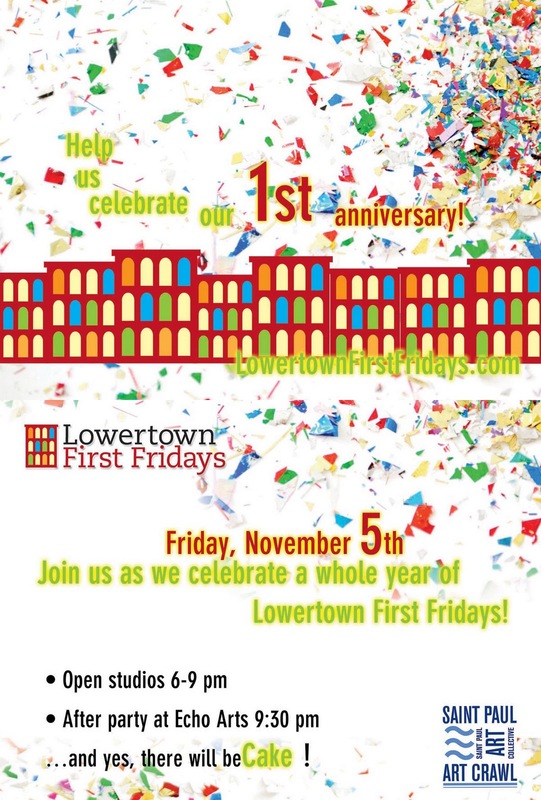 Lowertown First Fridays: It's our Anniversary! Lowertown First Fridays is almost a year old...and we're planning special festivities to celebrate! Well over a year ago a group of Lowertown artists (including myself) started meeting to plan a monthly open studio event in Lowertown St. Paul. We launched the event last November and slowly the event is growing. We thought it would be a good idea to celebrate our very first anniversary! 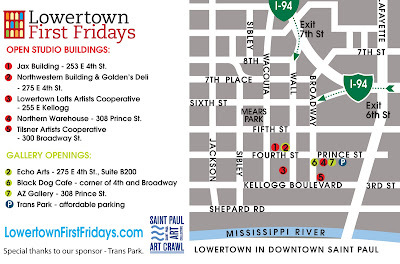 As always, there will open studios at several different artist buildings in Lowertown. At my building, the Tilsner, we are hosting a "Best of the Tilsner" show. There will also be an after party at Echo Arts starting at 9:30 pm. Of course, there will be cake! 6 - 9 pm ! This past week was all about laying low, enjoying perhaps the last bit of warm fall weather, while recovering from the Art Crawl. I had my mom here for a visit. It was a good visit, but hard in some ways. My mom turned 80 this summer. In many ways, I think she is doing very well. (I start wondering how my body will be holding up in 30 years!) But there is no denying that she is aging and her body is slowing down. I can't help but worry or fear the time when her health will fail even more and ... it's hard to think about. I imagine I'm also thinking about these things more, because in a few short months I will be turning 50. I realize I am becoming a member of an older generation. Whatever that means. It's all a matter of perspective. I am not yet ready to think of myself as part of an "older" generation. I guess I'm defining what that means for me. I am still embracing the freedom of having grown children, who still look to me for support, but not on a daily basis. I am trying to pursue some of my own dreams...which means sometimes putting myself first. Boy, is that hard to write. It doesn't mean ignoring family and friends or other things that I care about...it just means not always sacrificing my own goals to make sure others are happy. These days, I am making some very conscious decisions about what I want to do with the second half of my life. BIG stuff. My mother spent her life raising six children. She has 15 grandchildren and 22 great-grandchildren (so far)! She was the mother that was always home when I came home from school and often had something good coming out of the oven about the time I walked in the door. (I got my love of baking from her). Her life pretty much revolved around her family. I'm not sure she would complain about that. I hope she knows how much we appreciate all the sacrifices she made. I feel a need to make sure she knows that. We were not a family that said to one another "I love you", but it was understood. It still seems stupid to me that it's so hard to say that to my mom or my siblings. Some things are hard to change. I'm working on it. As I was raising my kids, I told them everyday that I loved them. Now those very important words flow from our lips to each other with ease. It should be that way. Consider this a warning that these days I'm juggling some big issues...I'm thinking a lot about the second half of my life. I'm determined to do things I love. Family will always be very important. Friends too. Relationships are a core part of my life. But I'm also thinking about how I will fill my life with meaning and activities that will keep me young...in spirit, at least. And for me, that means doing what I love. 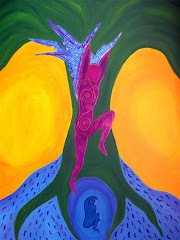 What I love most, is making art...painting...filling my life with color. I'm exploring how I'm going to do that. Life is, after all, a work in progress. Traffic was down just a bit...probably due to the incredibly gorgeous weather outside. Highs were in the 80's--20 degrees above normal. Last year at the Fall Art Crawl we saw snowflakes (the opposite extreme)! I don't fault anyone for not wanting to spend time indoors when the weather was simply breathtaking! I'm now spending a few days at home...cooking soup, enjoying a visit with my mom, and soaking up this gorgeous fall weather that we are being blessed with. Hopefully, my soul will be recharged in a few days and I will be back in the studio! I am baking my favorite Molasses Cookies for Art Crawl. I found the recipe years ago in an older edition Better Homes & Garden cookbook. I saved a worn copy of this cookbook from being tossed when my mother moved years ago. I've since have started a small collection of old cookbooks. I love the ones from the 50-60's, because their illustrations are rather comical now--and they remind me of my childhood. Now there is a painting to go along with the recipe! I had completed the whole painting, but was trying to come up with a plan for the background. I felt the woman looked very domestic and then creative inspiration hit! I decided to incorporate the cookie recipe in the background. I decided to name the piece Mabel was a Domestic Goddess (she seemed like a Mabel to me). My creative wheels were still turning. I was thinking that this would make a great commissioned piece (and a great gift that will remain a keepsake for years to come!). If you have a treasured family recipe, I could use that recipe in the background. I am not trying to do portraits, but would certainly be open to some input on colors... Each piece would be unique. I think it would even be awesome if a broach/necklace with special meaning to the recipient could be incorporated in the piece (otherwise, I have a stash of vintage pieces). What do you think? 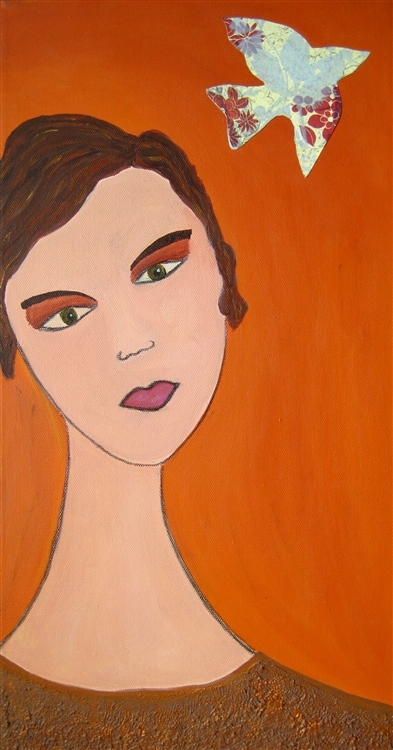 This piece is 10x20 (offered at $125). I was also thinking of offering it in a 12x24 size (offered at $150). I will have this piece on display during the Art Crawl and will be accepting commissions. Following Art Crawl, I may throw it out there on Etsy! Chill dough. Roll into balls the size of a large walnut. Dip tops in sugar. Place, sugared-side-up, on greased cookie sheet. Press with fork (or meat hammer). You may sprinkle each cookie with a few drops of water to produce a crackled surface. Bake at 350-375 for 10-12 min. This week is all about the Art Crawl. It's crunch time...the Crawl starts on Friday. I am focusing on final details...at the studio, I'm varnishing paintings. At home, I'm cleaning and reorganizing our place to turn it into a mini-gallery for the weekend. The Art Crawl is always a big deal...well, to me and all the other artists that will be opening their studios, it's a big deal. Getting ready for it you sort of hyper-focus on preparing for those three days. It's a little overwhelming. To be honest, this Crawl feels even bigger than some of the past Crawls. Partly because for the past four months my primary focus (occupation, if you will) has been painting. The Art Crawl is my first big opportunity to get feedback from a larger group of people. It's also an opportunity to hopefully sell some of my work...and that sort of financial validation means a little more than other times too. 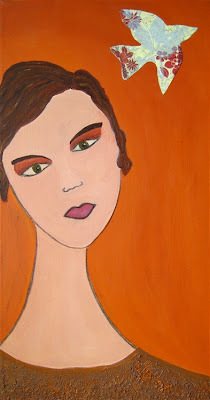 People often ask if it's hard to part with my paintings...and the answer is usually "No!" First off, I don't offer my paintings for sale until I'm ready to part with them. Whenever I have sold a painting it has been such a wonderful exchange and I've always felt that my painting has gone to a good home. There's something exciting about knowing that your artwork is a treasured possession in someone's home! 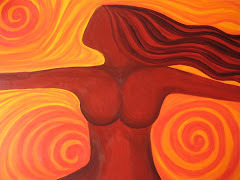 And lastly, I have to sell some paintings to make room for all the new ones I'm going to paint! Regardless, I'm ready for the Art Crawl to begin! I am anxious to start hanging my work and to put everything in place! It's always so much fun when the event gets started--there's so much energy. And I always enjoy meeting and talking with new people (and returning visitors as well!) about art, what pieces of mine they like...even if I don't sell anything, that feedback and energy keeps me going for a long time following the Crawl! So a few more days of final preparations and the show is on! The weather forecast for the weekend is fantastic--low 70's for temps and the only chance of rain on Sunday--great Crawl weather. I'll let you know how it all turns out! Mixed in with Art Crawl preparations, I've been able to enjoy the past few days of beautiful fall weather, complete with some artsy activities. Friday afternoon hubby and I took off to enjoy a bit of the Fresh Art Tour--basically a studio crawl in the Maiden Rock-Stockholm-Pepin area of Wisconsin. It's just a little over an hour drive from the Cities and so worth the trip. Especially lovely along the river bluffs with the leaves changing color in the fall. Our first stop was in Maiden Rock. We visited Swan Song and Secret Heart Gallery--two lovely galleries/homes located next to one another on Hwy 35 as you drive into town. Both are worth the visit. They are primarily open on the weekends in the summer. I will be back next year for sure! We made a quick run through Stockholm, where we enjoyed several stops at local galleries/shops. Stockholm is my favorite town. It always makes me happy when I visit. It has that lovely small town vibe mixed with artsy flair. Perfect combo, if you ask me. You can see some of my Stockholm pics on this earlier post. Following our delicious pie at the Stockholm Pie Company (crust second only to my mom's), we headed out of town to check out some other artist studios. We stopped at the sculpture studio of Myklebust + Sears. The drive alone with quite the treat, but we also had a lovely visit there and learned that they are working on some large public pieces that will be featured at the light rail station a few blocks away. I realized that I have also seen their work other places in the Twin Cities. We continued to meander and finished our tour at the Hilsgen Family Farm, where they featured lovely hand-woven rugs and tasty gourmet goat cheese. I loved visiting their goats. Saturday, after I dropped hubby off for an acting gig, I spent an hour strolling through the collection of the Minneapolis Institute of Arts. Certainly, not enough time to take in much of the collection, but enough time to get my day off to a great start. I need to head back there soon for a much longer visit. I spent a good chunk of the afternoon at a Mentor Introduction session for the Warm Mentor program--I will write more about that later. Following all that, I picked up hubby and we headed to Trotter's to take down my art that has been hanging there for two months. It was a nice to have my work out in the public. And excellent timing to get it all back in time for the Art Crawl. Today we enjoyed a beautiful, beautiful day at Target Field. The sun shone on us brightly for nearly the entire game! Unfortunately we lost, but are headed to the playoffs. We are not likely to go to any of the postseason games, so this was our last game of the season. I LOVE baseball & the Twins...and can't believe the regular season is over. Of course, we still have lots of baseball to enjoy--since we plan to keep winning all the way through till the World Series! I hope that you all enjoyed your weekend! Now I'll be buckling down and finishing preparations for the Crawl. Tomorrow I'll be locked up in the studio, finishing a little painting and varnishing. St. Paul Art Crawl--just a week away! Hundreds of Artists will open their studios to the public during the Fall Art Crawl. 50 Artists will be showing their work in the Tilsner building alone. This includes painters, potters, photographers and much more! Many buildings will also offer musical or theatrical entertainment. 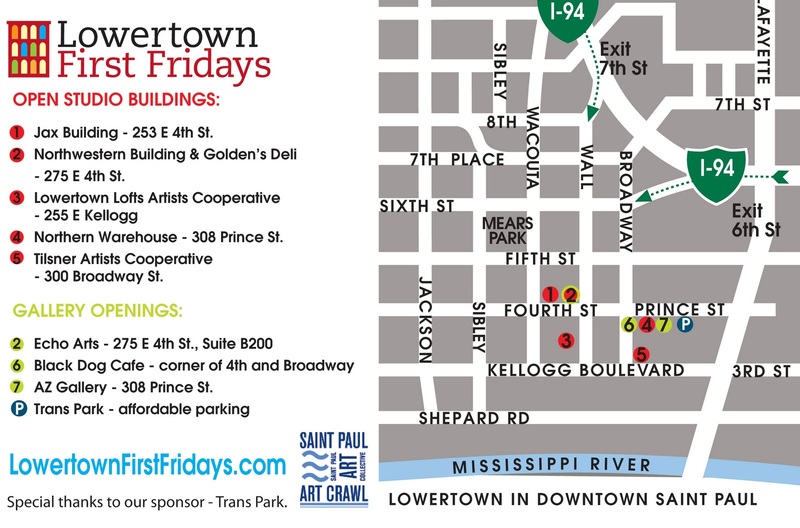 There is so much happening in Lowertown this weekend...you can check it out here! There are over six additional locations within walking distance of the Tilsner that will feature open studios and art--that alone will offer an evening worth of entertainment! It is a great opportunity to view local art--and meet the artists! Convenient parking is located across the street from the Tilsner at the Kellogg & Broadway lot (free during the Crawl). You can even catch a shuttle bus there to take you to different locations. Yes, the roads are a bit of a mess (due to light rail construction), but we have been assured that things will be somewhat put back together for the Crawl. But it is always a good bet to park at a convenient spot (like Kellogg and Broadway) and walk between buildings. This is the best opportunity to see all of my work. Since I have been painting full-time the past 4 months, I have lots of new work to share! Come see what I've been up to! And as always, I'll be offering my guests some tasty treats (including home-baked goodies)! I hope to see you sometime during the Crawl!